The rutabaga or Swedish turnip (Brassica napobrassica) is very closely allied to the common turnip. Both are members of the mustard family and belong to the same genus. One may rather easily distinguish it from the turnip, however, by the short stem or neck at the upper portion of the enlarged stem-root vegetable. It is a smooth-leaved biennial producing a flower stalk 2 to 3 feet tall. Like the turnip it is a cool-season crop but, since it requires more time to mature, it is sown 4 to 6 weeks earlier than the fall crop of turnips. Seed of the American Purple Top variety was planted June 16 in rows 16 inches apart. Later the plants were thinned to a distance of 5 inches in the row. Early Development.--On July 10 the plants had four large leaves each in addition to about two young ones. Leaves of average size had blades 2.5 inches long by 2 inches in width. The plants had a height of 4.5 inches. Rutabaga is characterized by a taproot, which was at this stage about 3 millimeters in diameter at the soil surface. It tapered to 0.5 millimeter in thickness at a depth of 10 inches. Several roots were traced throughout their rather vertically downward course to their ends at depths of 17 to 21 inches. No branches appeared in the first inch of soil but on a typical plant 19 arose from the second inch, 11 from the third, and 9 from the fourth. At greater depths branches arose at the rate of four to nine per inch. Figure 43 shows the somewhat conical shape of the root system. The longest laterals originated at about the 3-inch level and ran outward but only slightly downward giving the root system a total lateral spread of 12 inches. Most of the laterals, however, did not exceed 2 to 8 inches in length and beyond a depth of 9 inches they were only 1 inch or less long. Branching, in general, occurred at the rate of three to eight branchlets per inch. Usually these were only 0.1 to 1 inch in length. None except the longest had sublaterals. Fig. 43.--Root habit of American Purple Top rutabaga at the age of 24 days. Later Development.--Seventeen days later, July 27, a further examination was made. The plants were now 12 inches tall. Each had, on an average, six large leaves with blades about 8 inches long and 5 inches wide. In addition two smaller ones added to the rather large and constantly increasing transpiring area. The absorbing organs, however, had kept pace in growth with the tops. The taproots had extended downward to depths of about 3 feet. The laterals, in their obliquely outward and downward course, increased the lateral spread to 18 inches. Many of the larger ones had turned downward at various distances from the taproot and, paralleling its course, extended to near and even beyond the 2-foot level (Fig. 44). The enlarged portion of the taproots had reached a diameter of 10 to 15 millimeters near the ground line but tapered to only 2 to 3 millimeters in thickness at depths of 3 to 4 inches. Below 10 inches the taproot never exceeded 1 millimeter in thickness and was usually much less. Fig. 44.--Rutabaga 17 days older than that shown in Fig. 43. Note the widely spreading and vertically descending branches. Later these thoroughly ramify the deeper soil. As at the former examination, no branches occurred in the first inch of soil, but frequently 45 to 50 hairlike but densely rebranched laterals were found in two rows, one on each side of the root, in the second inch. These were only 0.5 inch or less in length. At greater depths the number of branches was approximately as before but the branches were larger and longer. Practically all of the long branches, i.e., 9 inches or more in length, arose in the first 8 to 10 inches of soil. Running outward and then downward they filled in the soil volume not occupied by the main root and its branches and thus greatly extended the territory for absorption (Fig. 44). Thus the surface 18 inches of soil was well occupied with roots and some extended deeper. Branching was quite profuse, especially near the taproot where 15 to 20 laterals per inch often occurred. Otherwise their former rate of branching (3 to 8 per inch) prevailed. The branches, however, were much longer than before, being 0.2 to 3 inches in length, and all of the larger ones were clothed with laterals of the third order. This added greatly to the absorbing area. 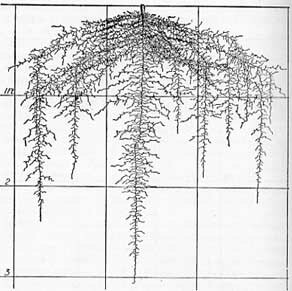 Between depths of 10 and 24 inches the taproot gave rise to six to eight laterals per inch ranging in length from 0.3 to 3 inches. Only the longer ones were rebranched. Beyond 2 feet the laterals were shorter (0.3 to 1 inch) and somewhat less numerous. The last 2 inches of root ends were unbranched. Maturing Plants.--By Sept. 5 the plants were approximately 2 feet tall. Each had about 15 large leaves with blades 12 to 15 inches long and 6 to 8 inches wide. The tops had a total spread of about 2 feet. The lateral spread of roots had not increased beyond that of the preceding examination (about 18 inches). In fact most of the major laterals, which originated in the surface 8 to 10 inches of soil, ran obliquely outward only 4 to 12 inches before turning downward. Aside from the growth of the taproots, which had doubled in length and reached the 6-foot level (maximum, 75 inches), the main extension of the root system was due to the downward penetration of these large laterals. These strong roots varied from 5 to 12 millimeters in diameter and reached depths nearly or quite as great as the taproot. The fleshy portion of the taproot was about 3 inches thick, tapering to 1 inch in diameter at a depth of 4 inches. It ran in a generally vertically downward direction but deviated from this course through short distances in penetrating the hard soil. Below 3 feet they were often only 1 millimeter in diameter. From irregular areas on two sides of the fleshy part of the taproot, many fine roots arose. Although very variable in extent, it was not unusual for these areas to cover a portion of the root exterior 2 to 3 inches long and 1 to 2 inches wide. These roots were very much like those on the sugar beet. They were mostly 1 millimeter or less in diameter and from 2 inches to 2 feet in length. With their densely woolly network of branchlets, they formed great masses of rootlets. As many as 80 were counted on a single square inch although where the roots were somewhat larger the number was not so great. A typical root system had 30 major roots, arising in the first foot of soil. These were intermingled with smaller branches. Many were more than 1 millimeter in diameter and ran outward and downward in such a manner that the soil, 12 to 18 inches on all sides of the plant, was filled with a great network of roots to a depth of 5 feet at least. The degree -of branching can scarcely be overstated. In the first foot of soil the main laterals were clothed with a dense network of branches at the rate of 40 to 45 per inch. All of the branches, with rare exceptions, were thread-like and many were profusely rebranched two or more times. Below the 10-inch level large branches were rare, never more than 2 or 3 being found. These almost always ran obliquely outward 3 to 5 inches and then pursued a course downward rather parallel to the taproot. Small branches arose at the rate of 10 to 15 per inch although the taproot sometimes ran distances of 2 to 3 inches in hard soil and gave rise to only half a dozen small branches. In the mellower soil below 4 feet the roots branched much more profusely. Here many of the hairlike laterals were only 8 to 12 inches long and often pursued a course parallel to the taproot. Others spread horizontally or obliquely. With their exceedingly numerous branches they formed cobwebby networks in the moist, mellow soil. An area of 9 square feet formed one end of the volume of soil occupied, by the roots of a single plant. Of course neighboring plants also extended their roots into this territory. From just below the soil surface (an area not occupied at the July examination) to a depth of at least 20 inches, the soil was a veritable network of rootlets. At greater depths, until the mellow soil at 4 feet was reached, the root branches were confined largely, but not entirely, to the joints in the clay. Here they formed a cobwebby mat of white roots glistening in the dark-colored soil. Roots were abundant to the 5-foot level and many extended even deeper. Throughout this entire soil volume the root network was of such a pattern that one had to look closely to find the directions of growth of the main roots. Thus because of its great extent and high degree of branching the rutabaga has a very efficient root system. Summary.--The rutabaga, closely related to the turnip, has a root habit very similar to it. The rapid growth of the taproot, the wide spread of laterals in the surface foot, and the tendency of those originating deeper to extend more obliquely downward are also characteristic of the turnip. As in the case of the turnip also, the 3 inches of surface soil, until late in the life of the plant, are never well occupied. The vertically downward growth of the ends of the spreading laterals is also the same. Plants 6 weeks old have a lateral spread of 1.5 feet, which is somewhat less than that of the turnip, and rather completely occupy the soil to a depth of 18 inches. The soil volume thus delimited is not extended except in depth. Mature plants have a working level of 5 feet. Branches from the taproot, which penetrate somewhat deeper, though abundant, are not extensive, and the bulk of the absorbing system is formed by the numerous long laterals which originate in the 8 inches of surface soil. In addition, a dense absorbing network of late origin grows near the plant in the soil surface. 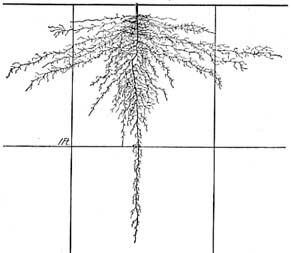 Throughout the entire extent of the very elaborate root system absorbing masses of rootlets occur in such profusion that their number can scarcely be over-estimated. The root relations in regard to cultural practice discussed under the turnip also apply to the rutabaga.